It was December 18, 1965 - The Branham family (all except the eldest daughter, Rebekah) were travelling east, in two cars, from Tucson, Arizona to Jeffersonville, Indiana. They were heading 'back home' for the Christmas Holidays. Driving in the opposite direction was 'off-duty' soldiers who had decided to get a head start on the Christmas Celebrations by getting drunk. But on this night the driver of that vehicle would have an appointment in Eternity. Before the foundation of the World, God knew that this would be the night when two cars would meet head-on, instantly killing the drunken soldier and six days later claiming the life of His Servant and Prophet, William M. Branham. At this site we have included two accounts of that tragic accident which claimed the life of God's Prophet and injured his wife and daughter. 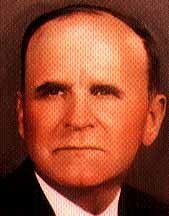 The First account is that given by his son, Billy Paul Branham at a Memorial Service conducted by the Full Gospel Business Men International in Phoenix, Arizona, in January 1966. At this link, Bro. Billy Paul explains in detail the incidence leading up to the accident and the aftermath which took it's toll on many thousands of people in a physical, emotional, and spiritual way. The Second account is that given by a close personal family friend of the Branham family, Bro. Pearry Green of Tucson, Arizona. From the moment he arrived at the hospital he took charge of the affairs - from having extra phone lines installed to keep the Evangelical world informed of Brother Branham's condition, to looking after funeral arrangements after Brother Branham passed away. We have take this account from a book written by Rev. Green. In Chapter 15, entitled The Accident he gives an overall view of things from a natural and a Scriptural standing. It's important that we understand, in a Scriptural Light, why God's Servant was taken from us in this manner.